E-1W - The ENVIROMUX® 1-Wire Environment Monitoring System 1-Wire Sensor Interface monitors critical environmental conditions, such as temperature, humidity, liquid water presence, power, intrusion, and smoke. When a sensor goes out of range of a configurable threshold, the system will notify you via email, web page, network management (SNMP), and/or SMS messages (via external USB 3G modem). The system functions independently or as an IP-connected remote sensor for the E-2D/5D/16D. 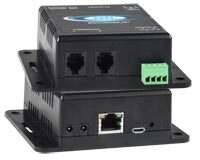 The unit supports 24 single reading 1-wire sensors in any combination-temperature, humidity, dew point, thermocouple or digital inputs-and 2 separate digital inputs.